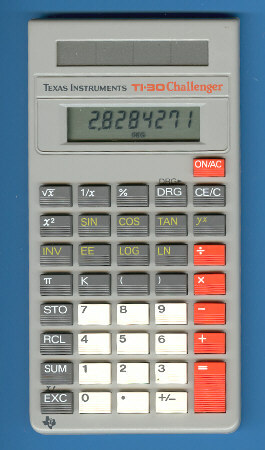 This calculator followed the first TI-30 Challenger soon. Main difference is the missing window on the display and the solar cells. It is in one line with the TI-30 SLR+ and the TI-31 Solar. Dismantling the TI-30 Challenger reveals no big surprises, a Toshiba single-chip calculator circuit soldered on a cheap looking printed circuit board (PCB). Don't miss the TI-25 SOLAR with similar performance.